This is an evergreen shrub, pretty common in the scrubby parts of Nova Scotia. 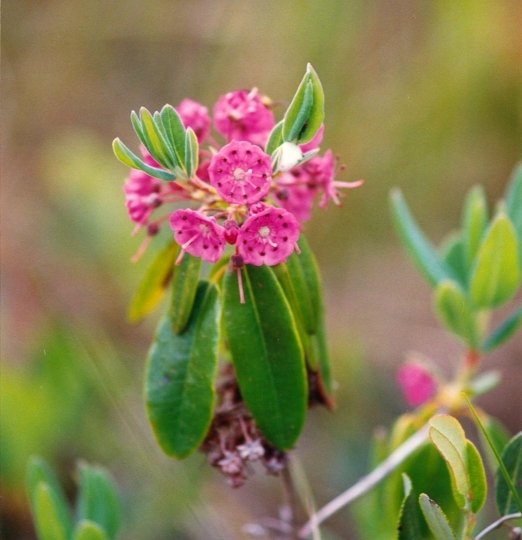 The Sheep Laurel is of the heath family. The flowers, clustered toward the top of the bush, are saucer-like buttons, dark pink, with an array of 10 black points circled around midway to its greenish-white center; these black points are the anthers, sunken in impressions in the petals, which will pop out when touched. The leaves and stems of the Sheep Laurel have long been known to be poisonous to livestock.